Brenda Zuk was born in Winnipeg, Manitoba, Canada, and was raised in Elora, Ontario. She received a Bachelor of Applied Arts in Fashion Design, at Ryerson University, Toronto, Ontario. Her knitwear design business, Needle Beetle, was launched in the fall of 1993. Brenda's extensive gardens are home to the flowers and creatures that are the special inspiration for many of her knitted nature studies. She envisions the finished piece in her mind, working it out mathematically on paper long before the yarn and needles ever meet. The colourwork, intarsia, lace and textural designs can then emerge from the needles, just as Brenda first saw them, to become the perfect portrait of a timber wolf or lacy butterfly. She is an artist of many talents and has been drawing and painting for as long as she can remember. Combining that history with a degree in fashion design results in designs which are realistic, intricate, vibrant and honestly refreshing. Brenda's last name, Zuk, is Ukrainian which means beetle in English, hence "Needle Beetle"! 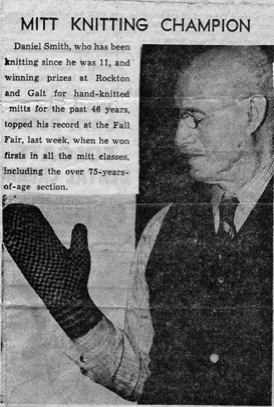 Brenda's Great-great-great Uncle Dan on her mother's side was well known for his colourful patterned mittens which always won a prize at the Galt Fall Fair in Ontario. He gave his Great-great Niece Nancy (Brenda's mother), a pair of 1st prize mittens one year, they were yellow and brown and her pride and joy. Copyright © Needle Beetle. All rights reserved.